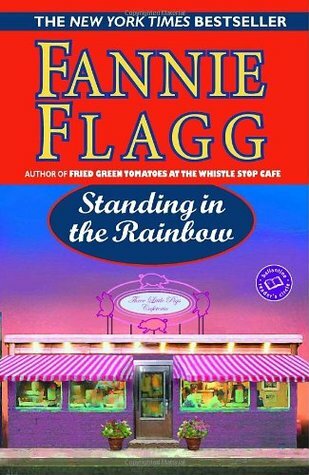 In Middle America, in an ordinary town with down-to-earth ordinary people, the lives of various men and women are followed like threads and weaved together to create the tapestry that is Fannie Flagg’s Standing in the Rainbow. Set initially in the 1940s, the story immerses the reader in the sights, sounds, and cares of that time. It then ages into the subsequent decades, documenting the characters’ lives, growth, and interactions as they experience societal and cultural changes on a rapid scale. From World War II and the mom-and-pop era, to big chain businesses and the internet age, the characters learn to adapt to the world around them while simultaneously dealing with the complexities of their own lives. One main character, Neighbor Dorothy, is so well constructed that by the end of the story she seems as much a friend to the reader as she is to the listeners of the radio show she hosts daily from her own living room. Her son Bobby–a handful of a child if one ever existed–bursts from the pages with all the busy mischief common to boys. Equally strong is Flagg’s writing style. Her use of descriptions are fresh and creative. Bobby’s boyish energy is summarized with “If you could have plugged him into the wall he would have lit up like a 500-watt bulb.” Her humor was prevalent throughout, making me laugh aloud several times. Despite the strength of Flagg’s unique voice as an author, I wasn’t as enamored with the story itself. There were too many characters. Though some of them were strongly developed, many others had stories (and backstory) so choppy it was hard to connect with them. Also, some were mentioned so infrequently that by the time they appeared on the scene again, I could tell they had been introduced before, but by then I couldn’t remember who they were. Sometimes the characters themselves didn’t even know what they wanted, so I had no reason to root for anything in particular and even became bored with their stories. As a result, I found myself antsy and even a bit resentful of the time invested in reading it. In the end, I finished Standing in the Rainbow with admiration for the author’s writing style and abilities; as for the story itself, I was just glad to be done with it. I gave it two out of five stars. Click here for the list of the remaining books: Seven Books in Seven Weeks: The List . I really liked the movie with Matthew McConaughey. It’s been a while since I’ve seen it but I usually won’t read a book if I’ve seen the movie first, though I probably should do it in that order since I never like a movie after I’ve read the book first. I’ve got three more books in this series then I can breathe easy a bit :-).